If your chain’s seen better days, best get it swapped out asap. And if you fancy saving a few quid, fitting it yourself is a fairly easy introduction to more serious spannering. Here’s how to do it! The amount of kit you need depends on how far you’re going. If you fit a new chain and both sprockets at the same time, you’ll need a chain splitter and grinder to swap chains. 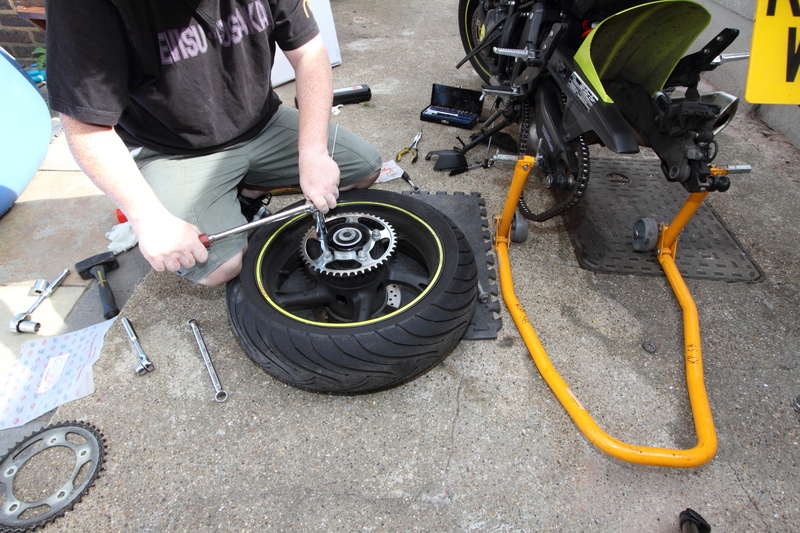 Get the bike up on a paddock stand, and we’ll do the front sprocket first. 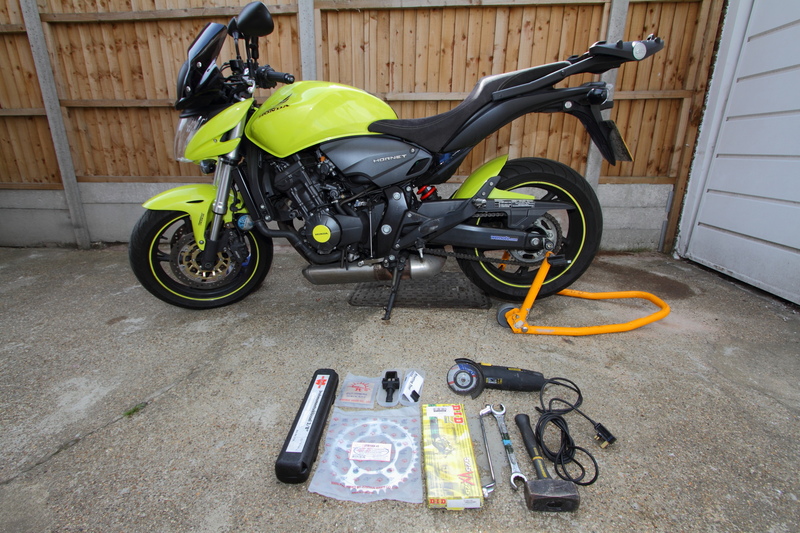 It’s under a cover, which will need a few bolts removing You usually need to remove the gear change lever as well. 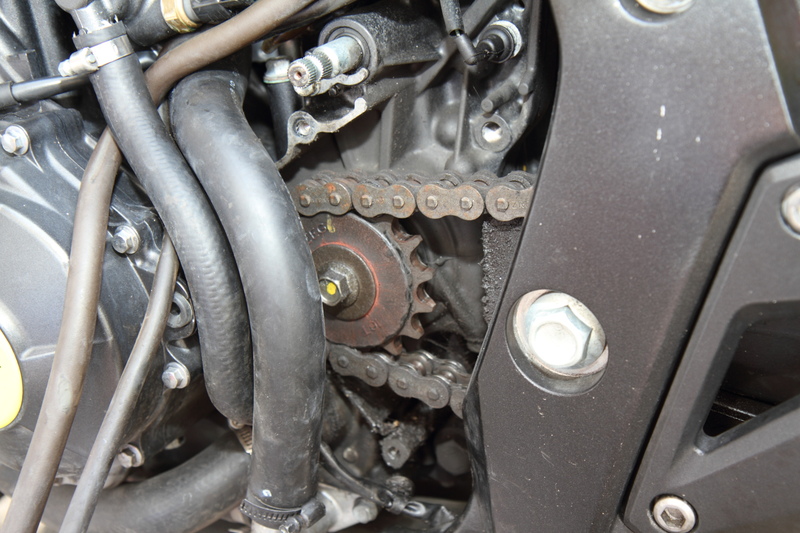 Loosen the pinch bolt on the gear change linkage or pedal, and slide it off, noting roughly where it’s positioned. Then unbolt the cover bolts and pull the cover off. Next, remove the rear wheel. Loosen and remove the axle nut, then carefully tap the axle through, and pull it out while supporting the wheel. Watch for any wheel spacers or brake pads falling out. Here’s a tip – it’s often quicker to unbolt the rear brake caliper and hang it carefully to one side than try and finagle the wheel in and out with the caliper in place. Gradually loosen the sprocket retaining nuts in a diagonal order, then remove them. They’ll be tight, but the tyre gives good grip and leverage. Hold it with your knees as shown, and get a large spanner or bar onto the nuts. Factory manuals say self-locking nuts like these should be replaced, but we don’t bother if they’re in decent condition. It’s worth checking the new sprocket fits properly – our new chainwheel is a perfect fit. Slip the old sprocket off and put the new one over the studs. Refit the sprocket nuts, and tighten to the appropriate torque. Search online or ask your dealer for the correct setting. Splitting the old chain is a bit of a faff, but follow the instructions with your chain splitter. Use a grinder to grind the mushroom heads off the pins on one side, then use the splitter to push the pins out of the side plate. With the chain split and out, you can slip the front sprocket off, and fit the new one. When you refit the wheel, screw the chain adjusters all the way in so the wheel is as far forward as possible. Refit the wheel, remembering to replace any spacers, pads and caliper if you removed it. Now you need to fit the new chain. Find the joining link – it should be a rivet type, with soft-headed pins. Slip the chain through and onto the new front sprocket, and back round the rear sprocket. This will make it easier to position the joining link. Assemble the link with any ‘O’ rings, and use the chain splitting tool to crush the pin heads over the side plates, securing it in place. Adjust the chain to the recommended amount of slack, torque up the rear axle, and you’re off!